Live a Colorful Life: Quilting in the Cabin: Year 11! Last weekend was our 11th Annual Quilting in the Cabin. Eleven years of spending time with good friends, fabric, and food in Dotty's cabin,just outside Yosemite National Park. This was the view of the inside. We have sewing station set-up down to a science. Seriously. We had stuff unloaded from the car, food into the refrigerator and our sewing gear set up in about thirty minutes. Years ago we decided that three meals a day was way too much food. So we cut it down to two meals a day, and a midday snack. Breakfast was typically nice and hearty: bacon, eggs, and fruit. For dinner we would have something like this: lettuce wedge all dressed up with cherry tomatoes, bacon and bleu cheese, cheesy potatoes and steak, a nice bottle of wine. And traditionally, Dotty makes the most amazing lemon pie in a meringue crust (and next year maybe I'll remember to take a picture of it...). Last year we nearly forgot it. We drove back to her house to get it--it is that good! It is always a cause for celebration when someone completes a quilt top. We stop whatever we're doing and take pictures. It has taken us eleven years to figure out that we can take our completed projects outside and hang them over the deck railing. We may be a little slow on figuring out good photo-ops but we are not slow when it comes to having things to photograph! And then one of Dotty's neighbors wandered by and agreed to take a picture of us. I wish I would have taken a picture of him, holding four digital cameras! Have we not figured out yet that one picture could be emailed among the four of us? Um. Guess not. I snatched a piece of this uber-cute batik that Ruth was working with and used it for the back of the pincushion (it's much brighter than the picture--bright limey green with purple, hot pink and blue, and the cutest little stick people). During the weekend, whenever we finish anything, we hang it over the staircase railing. Such a pretty site by the end of the weekend. So sad when we have to pack things away to leave. Thanks, Dotty, for one of the best weekends of the year! And for those of you who have been following along with our efforts to get the cabins open at Lakeview Cottages: I think we have become, thanks to Mother Nature, a nonprofit organization this year (boo!). The first two rental weeks were canceled and we are still waiting for water (which seems ironic since we have had record amounts of snow, but one is not related to the other). We're hoping all the problems will be fixed and the water will be running by Saturday so our third-week guests can arrive. Wow!! Totally amazing quilting weekend at the cabin! Sounds like so much fun and you all made such beautiful quilts. Thanks for sharing! Wishing you more luck with getting your cabins open for the season! What a group of talented quilters. Can't believe all the snow still up there. That is so awesome, Cindy! Looks like such an amazing weekend, and what a lot of progress you all made! That looks like SO much fun. You are a bunch of fast sewers to get so much done in such a short time, but maybe without the distractions of home life it helps? I hope your cabins get up and running soon. It does look pretty with the snow, though. What a fun retreat and what wonderful creations!!! Wow! That is still a lot of snow. I'm hoping that you get the water (and snow melt) so your guests can arrive. Oh my goodness! That looks like soooo much fun! What a great way to spend a weekend...and very productive too! What a wonderful weekend to share with friends!!! And is that still snow on the ground up at your cabins??? Yikes!!! You just make me more and more jealous of the wonderful locations you are quilting in. I remember this from last year, but fun to see the quilts you made this year. I laughed at your comment about the midday boatload of food! You are pretty funny, girl. Sorry about your cabin "un-opening." 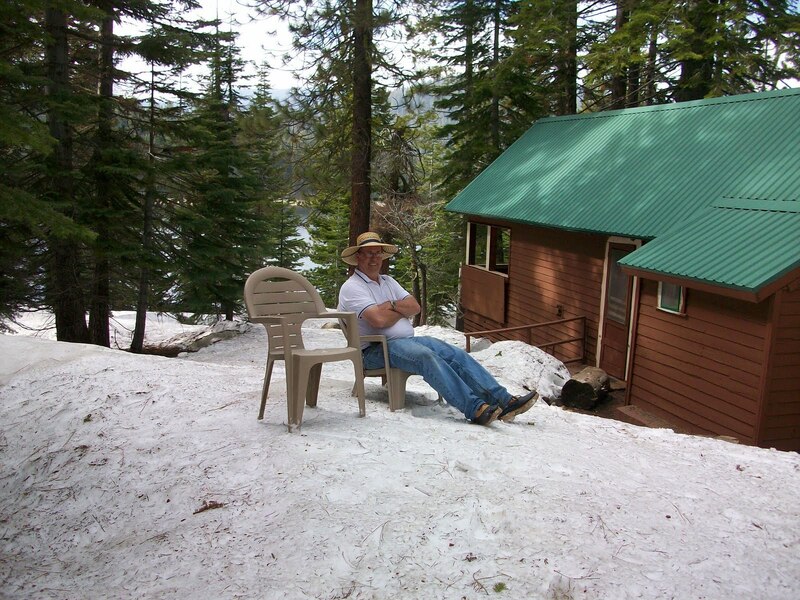 But that picture of sitting on a bank of snow, waiting for it to melt, is classic. Looks like a fabulous weekend! I love seeing all those beautiful finishes. That's the beauty of a quilting retreat - finishing so many projects that you just don't find time for on a regular weekend. I love your food plan too. I love a big breakfast and then grazing throughout the day so that would work for me. Wow! Eleven years! And what a great way to get some "work" done! Wow! Sounds like a great weekend. Wish I could have been there. Oh wait. I was there. Yes indeed, it was a supergreat weekend. Let's do it again next year. I love all of the retreat projects you gals managed to finish - that's great. It's tough to keep the food consumption down when you have a bunch of women together, isn't it? I like your midday feast (I mean snack) plan. Sorry about the cabin snow situation! !